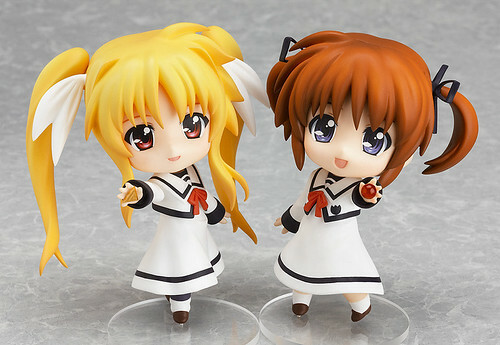 A Nendoroid set of Nanoha & Fate, both in their school uniforms! From the popular series with its second film fast approaching, ‘Magical Girl Lyrical Nanoha’, comes a Nendoroid set of both Nanoha and Fate wearing their school uniforms! Both Nanoha and Fate each come with a standard smiling expression as well as another smiling expression where they are both tearing up. They also come with extra parts that allow you to display them holding the animal forms of Yuuno and Arf! They also each come with their intelligent devices as well as school bags. Mikatan also posted a preview of this lovely pair of Nendoroid yesterday, showing its package contents as well as displaying a few pics. 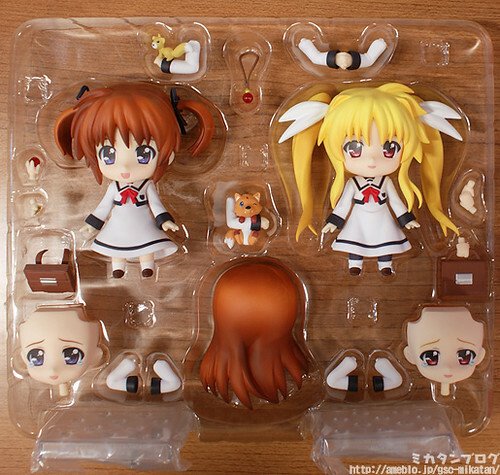 Nendoroid Takamachi Nanoha & Fate Testarossa: Seishoudai Primary School Uniform version will be priced at 6000 Yen. This entry was posted in News and tagged fate testarossa, mahou shoujo lyrical nanoha, nendoroid, takamichi nanoha, whl4u, wonfes.